Data from the National Educational Longitudinal Study show that on standardised scores in mathematics, reading and science, the highest mean scores are obtained by Asians and whites and lower scores are obtained by Hispanics and blacks. The same differences are present for the number of hours per week devoted to homework. It is suggested that motivational differences expressed in the amount of homework undertaken contribute to the group differences in educational achievement. Statistically significant correlations between the amount of homework and educational achievement support this hypothesis. There are also group differences in intelligence parallel to those in educational achievement, suggesting both intelligence and motivation are involved in racial and ethnic differences in educational achievement. The black mean is 1/2 a standard deviation higher than the white mean--a moderate difference. The higher measured black level of self-esteem might be actually tapping greater narcissism. The mean for gay men is more than four-tenths of a standard deviation higher than the straight male mean--also a moderate difference. From Nielsen, the graph suggests a cultural divide. 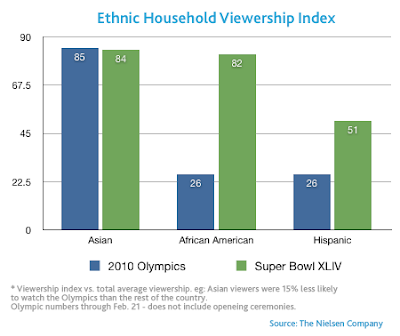 While whites and Asian Americans have been watching the Olympics in large numbers (white numbers not shown), few blacks and Hispanics are interested. The gap between blacks and Asians is eight-tenths of a standard deviation--a large difference. Blacks on top and Asians on the bottom is consistent with my experience in the classroom. With all questions, black-white differences are statistically significant. The Cohen d's reveal a gap of moderate size. All the answers are highly intercorrelated which indicates that they are measuring an underlying trait--something that might be termed spirituality. "Mindfulness" is a Buddhist term that refers to the accepting awareness of one's internal experiences. Blacks are significantly more likely than several European groups to have this type of experience often. I'm reminded of Louis Armstrong's "What a Wonderful World" (although he didn't write the song). This is consistent with the higher level of religiosity reported by blacks. One indicator of an immigrant group's ability to assimilate is the speed with which they depart from other poor groups and become as educated as the mainstream. Eastern European Jews, who came to America with nothing, reached average levels of education within a generation, and quickly surpassed by leaps and bounds the national average. Mexicans were in the American Southwest before American settlers arrived, but most Mexicans have arrived here in the past few decades. Using General Social Survey data, I calculated the mean years of school completed for Mexican Americans born in the United States and compared them with black Americans. I merged the 70s and 80s to get a sufficiently large sample. During that period, Mex-Ams were more than one year below the black mean. 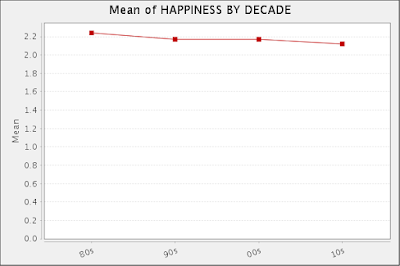 They made gains in the 90s, but dropped back in the past decade. In four decades, they have failed to reach the black level of education. This Pew graph shows that Millenials are less likely to belong to a particular religion than earlier cohorts. The circles indicate the points at which generations are at comparable ages. Twenty-six percent of Millenials are unaffiliated compared to 20 percent of Gen Xers and 13 percent of Boomers at the same ages. On the other hand, this table shows that young adults in the Aughts were slight more likely to pray daily than their counterparts in the 80s or 90s. Only 43 percent of Millenials agree, compared to 58 percent of Boomers when they were young adults. UPDATE: Using GSS data, I calculated the percent of young adults with no religion in the past decade for non-Hispanic whites only. It's 26.8%. The parents of Mex-Ams are four times as likely to have a drinking problem as Asian Americans. From Gallup, this appears to be a political map to me, but look at the top left. Sure it would be good if other secular states voted like Alaska and Wyoming, but they don't. People high in extraversion and agreeableness and those low in neuroticism (negative emotionality) have significantly more children than their counterparts. The finding that agreeable people have more offspring is consistent with GSS data which indicate that agreeable women have larger families. Homosexual men and women are 3-4 times more likely than their straight counterparts to have sexual relationships that have no emotional intimacy. GSS data indicates more Italian arrests, but the ranking is otherwise similar--NAMs on top, and Jews and Scandinavians on the bottom. The gap is wide: 5 times as many blacks as Americans of Scottish descent report having been in jail. Women participating in the Midlife Development in the United States Study (2004-06) were measured for waist-to-hip ratio (WHR). A ratio of 0.7 is considered to be ideal for health and attractiveness. Here are means by race/ethnic group (N = 1,891). The differences seem small, but the gap between Italian and Mexican Americans is sixth-tenths of a standard deviation. The groups are roughly 1 1/2 to 2 standard deviations above the ideal--they're all fat--but keep in mind that this is a sample of middle-aged women, with most of the sample between the ages of 40 and 60. * significantly higher than "everyone else"
People with no religion are 2-4 times more likely to be alcoholics. By the way, I thought textbook sociology teaches us that religions that forbid alcohol produce the greatest number of drunks, but only 2.8% of Mormons report this problem. I chose German Americans as the reference group since they are large and score second highest (after French Americans) on this measure of neutrality. Surprisingly, Irish Americans are a bit more neutral than those of English descent. Jewish Americans, by contrast, score in the non-white range (from the previous post, Native Americans are 20 percent). The study of Midlife Development in the United States (2004-06) asked 4,759 people if they prefer to be with other people of the same ethnic group. Here are the percentages who said "not at all." All non-white groups are more likely than whites to prefer the company of their own. Whites are six times more likely than blacks to have a non-preferential attitude. You can see that whites who say their ethnicity is very important are more likely than other groups to be very happy (not statistically significant, however). "The traditional American marriage is in crisis, and we need insight,” he said, citing the fresh perspective gay couples bring to matrimony. “If innovation in marriage is going to occur, it will be spearheaded by homosexual marriages." Don't miss Steve Sailer's article at VDARE where he makes careful use of L.A. county homicide data to show minority proneness to crime. Allow me to add one point to his argument. The state of California has been going after gang-related crime aggressively for a couple decades now. For a given crime, membership in a gang will get you a much longer sentence. Blacks and Hispanics have been disproportionately impacted by this strategy since few gang members are white. If these thousands of gang members were free on L.A. streets, minority crime rates would be substantially higher. The ratios are the share of physicians in each group compared to their share of the total population. Americans of Scottish descent and especially those of Jewish and Asian Indian are overrepresented among doctors. There are disproportionately low numbers of blacks, Americans of Germans and Irish background, and the sample has no Mexican American doctors. Fifty-three percent of Democrats and 61 percent of liberals have a positive image of socialism. The ratios are the share of all social scientists of a particular ethnicity compared to their share of the total population. Americans of English, Italian and especially Jewish descent are overrepresented. Those of German, black, and especially Mexican heritage are underrepresented. (Keep in mind that a GSS sample includes anyone who self-identifes as a social scientist, so it will include a lot of schmucks like me who barely count). Only DC makes it over the 30% mark for liberals. Couples who are not religious are almost twice as likely to be violent as those who are very religious. The finding is consistent with my General Social Survey analyses showing a positive link between never going to church and infidelity, and atheism and cheating. From Pew, you can see that interracial dating is almost universally supported by Millenials. 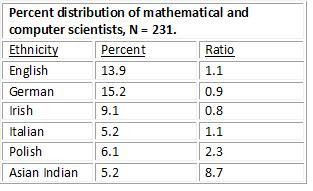 The ratio refers to the share of natural scientists compared to the ethnic group's share of the total population. You can see that Americans of English, Irish, Italian and especially Scottish descent are natural scientists in disproportionate numbers. The picture changes for mathematical and computer scientists. Americans of Polish and especially Asian Indian descent are more likely than other groups to have this kind of job. The only two large American groups that did not each produce at least 5 percent of natural, mathematical, or computer scientists were blacks and Mexican Americans. (I was surprised that Jews were only 1.0 percent of the natural scientists and 2.9 percent of the math/computer scientists--small sample size does not help).